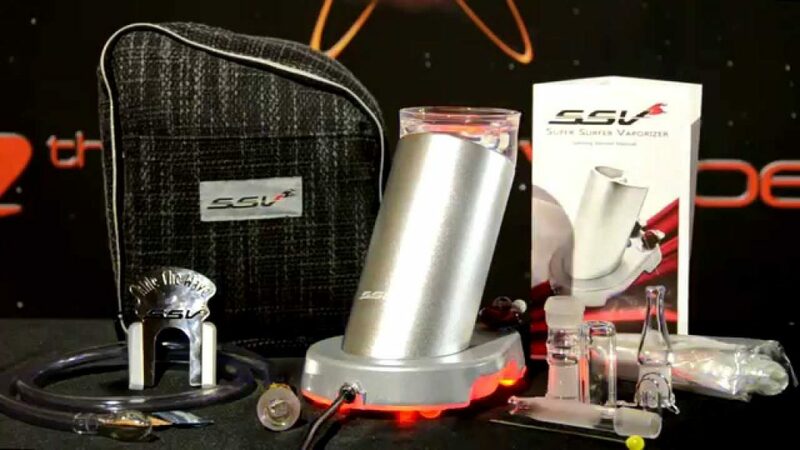 The Super Surfer Vaporizer has gained a loyal fan club over the years. This Super Surfer review carried this group of loyalists with high anticipation towards its release. Its creators, 7th Floor, had been working on this project for a few years. They are a small company rapidly growing and are the masters of some of the most remarkable vaporizers in the market out. They are the ones behind the beloved Silver Surfer and Da Buddha. The brand new Super Surfer didn’t fail to meet the expectations of its users, it was worth the wait. This desktop vaporizer is the best in town, it would be like searching for a needle in a haystack to find a monstrous vaporizer such as this. It has been carefully articulated to create the eloquent functionality for a great product. 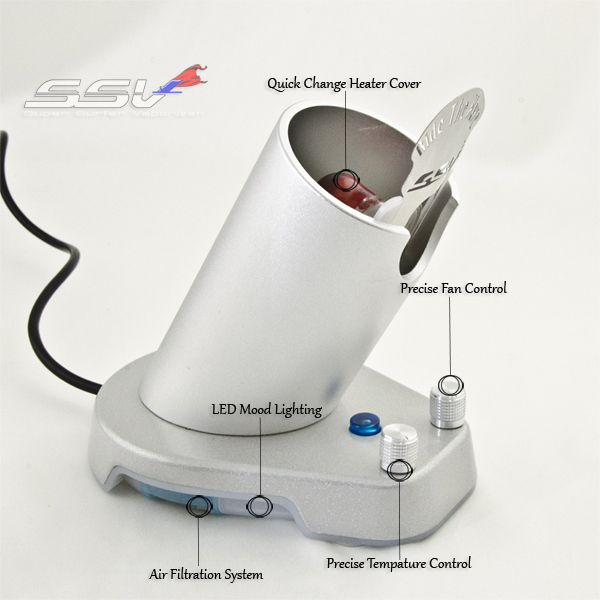 The vaporizer is available in a variety of dazzling colors that can be adjusted to your specifications. You can make combinations of the colors for your vaporizers that best suit you or represent your style. The glass mouthpiece of the vaporizer can be built to any of your desired specifications, the sky is the limit folks, let that imagination run wild. 7th Floor has gone all out by offering their loyal fan base with the ability to customize their favorite desktop vape in any way they see fit. An upgrade can allow the user to design the exterior in any way they see fit. The vape is designed similar to its previous model, the Super Surfer is comparatively larger and also made of a stainless steel vaporizer. The desktop vape also has a better experience, it is one of the best desktop vaporizers. There are two knobs placed on the base which is used to control the fan’s speed and the temperature of the vaporizer. Though these are a good addition, however, more preferable to have functions that can simultaneously and effectively display the current settings. It is also available in only one color, silver. It carries some of the similar features from its predecessor, with an addition of a few more attractive additions that enhance the capability of the experience this vaporizer can provide. It also includes a heat generator that is placed in the base that has been redesigned to give it the ability to switch out a bag for a whip. The base of the vaporizer is also made of stainless steel accompanied with LED lighting which can be adjusted according to your moods. 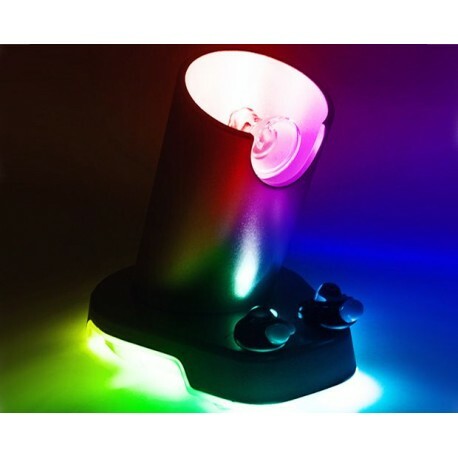 The LED lights carry a variety of 11 settings which can slowly fade, flash quickly or sustain a single color using 7 different colors like turquoise, red, blue, yellow-green or purple. There is a ceramic heating plate which reaches the temperature more steadily but it maintains the heat for a long time on a lower power. The glass mouthpiece doesn’t leave any residual smell or taste of the herbal vapor. We can also take solace in the fact that the herbs are entirely baked unlike most vaporizers which partially burn them, ruining the experience. There is an air filtration system, there have been strategically placed holes around the vaporizer to rid itself from any dust immediately. This fast paced ability to keep dust out of the system means that it is going to be a clean. According to the manufacturers, you can use a balloon bag manually as well. It no longer needs to depend on the vapor to be used. Better Than The Previous Surfer? They have worked intensively for upgrading this feature to provide the customer with an exceptional hands free use. 7th Floor claims that a bag as long as 10-feet can be used. Though it is available as hands-free many people prefer it to be used by the bag. The Super Surfer brings you the best vapor at a premium quality. It gives out a thick prominent vapor that also carries a great taste. It’s great that the Super Surfer has a great feel in regards to its performance. Though configuring the temperature and fan knobs are a little shoddy, we can still find that just right setting. 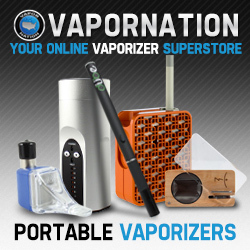 The vaporizers does satisfy all your needs and gives you much more to look forward. The Super Surfer is introducing us to a lightly similar version of Volcano, it offers the use of the casual whip or the balloon bag. Firstly, the casual whip kit, or the pipe mode, is the easiest way to go, it depends on your preference. The herbs are placed on the top of the glass tube, which is unique in its design, is that they can be made in accordance to your desire for an upgrade. The manufacturers have an in house glassblowers that make these exquisite design that can leave you in awe. Next, the easy on the eyes, balloon bags can utilize the exciting new functions of this model which include the fan and air intake systems. The balloon bag can vary in size, depending on the preference, it can be placed manually or on the vapor. The new air system function brings you the new and innovative feature that can give us a clean, pure and tasteful vaping experience. 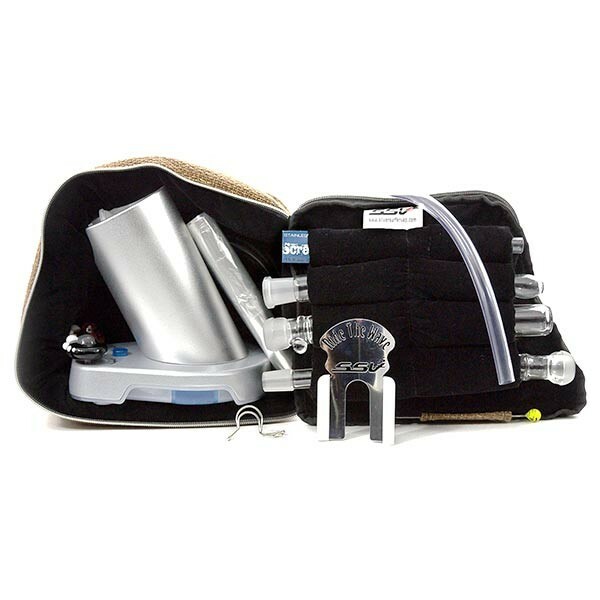 The filtration process has been built carefully so that as it functions, it can clear out all the unwanted dust or dirt in the vapor bag. This feature has been a great win in my books, because the vapor is truly in a class apart. It provides us with a set of astounding sessions. Worth It To Buy Super Surfer? The stupendous super surfer is an all-in-one masterpiece, it can allow you to use it with those intrinsic herbs, enchanting oils or wax and lastly, as an aroma therapeutic device. The vaporizer has to be used in three different ways for each thing. To use herbs we can use the whip, they feel and vapors are out of this world, they are thick and tasteful, we can also use it through balloon bags. Keep in mind, initially, you would have to make an entire thing for making the balloon bag usable. You would have to cover the glass wand with some of the balloon bag opening, and then adjust it at the opening. To use the oil or wax for either a joyous venture or aromatherapy, you have to place the aromatherapy device on the top of the vaporizer and simply let it do its work. Concealing this desktop vaporizer is a tad difficult and the sleek lightning feature makes it a tad harder. The lighting feature has a cool feel to it as it is used during the night or in dim lights. There are some heavy smoke sessions with the pre-set available settings that make elevate the entire experience. The varying range of colors make it look more intriguing. To summarize, though the LED lights are an attractive aspect of the vaporizer it can compromise the discreteness. The aroma therapy device however does provide help in creating an elusive distraction but it may still hold a relatively higher chance of not being concealed. It not only behooves me but has also proven to be more than satisfactory writing this Super Surfer Vaporizer review about what was once, the most highly anticipated vaporizer. The Super Surfer, in all its glory, outshines all the current vapes even today and it is worthy of its title. Albeit, regardless of its mundane design in the normal version and its array of features. The Super Surfer vaporizer provides the best taste and vapors, that I have experienced in a long time. Though adjusting to the draws was initially a struggle. Once I found the right settings, it was a thrilling experience vaping that incredible herb. The all-in-one feature is an admirable feature that makes the entire experience so enlightening. The much praise worthy vaporizer has dignified the long wait its loyal fan base has endured over the years. As a loyal fan among them, I was not disappointed, it was everything I expected it to be and much more. The dual methods to use it are an intriguing feature that makes the super surfer more worthwhile. 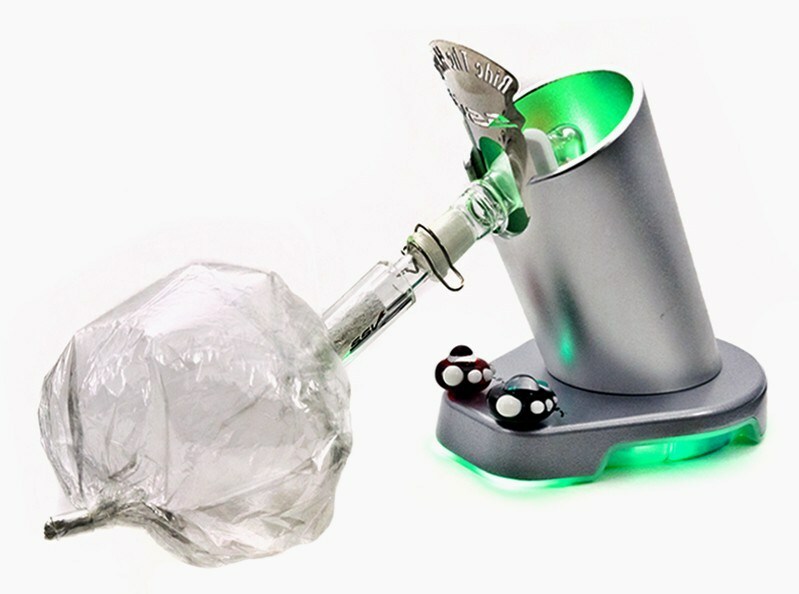 The vaporizer is accompanied by numerous amount of accessories, there is some great deal of glassware that looks uniquely outstanding and amazing. Unlike many other vaporizers, you wouldn’t spring out extra cash to purchase that mouthpiece or that slick wand. The super surfer is accompanied by a series of multiple series that have a high quality, they give us our money’s worth in its truest sense. The 7th Floor makes a bold statement by stating the outstanding feature that makes the desktop vape far more alluring. They state that the material used to design a super surfer can be used can last for 10 years regardless of how many times it is used within a day. They also proclaim that the material won’t rust or decay in any way even if it is used all day. Like most things, the Super Surfer has room to improve. The shoddy rotating temperature and fan settings on the front are rudimentary and antiquated. These knobs make it difficult to find the right setting that can be suitable. It can take up to strenuous hours for finding the right setting that can is usually preferable. Sometimes after I find my perfect set of configuration, a session with the group might require disrupting and its probably clear where my concern arises. They can further take some notes from the Volcano Vaporizer, their direct competition, which has outperformed it in some areas. The volcano provides the user with a better feel and experience on the use of its balloon bag. Even though it is an essential part of the new vaporizer, the innovative air filtration system in super surfer is dominant and great in its own way. Another matter of concern is the discreteness of this vaporizer, it can be difficult to conceal it when all the lights are glowing, but there is a simple solution in it that was previously mentioned. Though this costs a massive $500, the performance and features make this vaporizer worth every cent. There is a strong showcase of the renowned company. 7th Floor has yet to give us a reason to doubt their quality. The Super Surfer is a great addition to their other already famous vaporizers. The premium quality of vapor this gives its users is undeniable. There is a looming necessity to acknowledge the entire working of the vaporizer for this exceptional purity in its taste and thick vapors.